Resurrecting the dead typically ends in bloody madness: think the corpse of Gage Creed slicing through Herman Munster's Achilles tendon in Pet Sematary, or the corpse of Pet Sematary slicing through your ten dollars in Pet Cemetery II. Adroitly bringing an Austin institution back to life, the team behind Ski Shores Cafe. 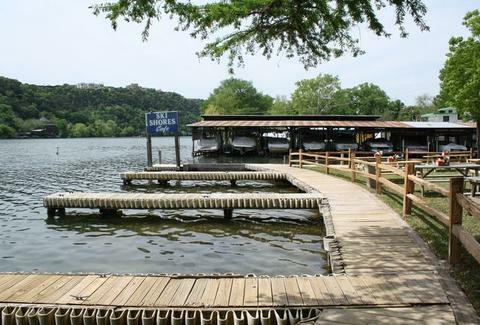 One of Austin's oldest family-owned operations until it closed in December, the iconic lakeside haunt's reopening Thursday under the management team behind Austin Java and Texadelphia, with improvements like a garage door that opens onto a new expansive waterfront deck, additional picnic table seating, two exterior bars with full liquor license, and added wait-service, because after driving all the way out there, you're certainly not walking for your food. Their between-the-bun menu's tossing in a new-style spicy black bean burger to augment the likes of a 1/3lb farm-raised catfish sandwich and their "infamous" 2/3lb Scooter Burger -- possibly a nod to that joke that sleeping with fat girls is like riding a scooter, except now you're the fat girl. Taco plates include beef, chicken, and newly added fish, while signature pizzas include the beefy Wakeboard (pepperoni, Canadian bacon, Italian sausage), the Hydrilla (spinach, tomato, 'shrooms, onion, green pepper, black olives), and the classic-cheese Ozzie, named after a neighborhood cat (as opposed to the Ozzy, topped with neighborhood bat). Since hanging lakeside without booze is blasphemous, the revamp's slinging domestic and Mexican beers, tbd signature cocktails, as well as margaritas and Mexican martinis -- the legendarily smooth concoction that the next morning's left so many wishing someone would just come and bury them.